Navicent Health Baldwin Needs You! Who are NHB volunteers? They are people who donate their time, skills and their talents to support our community hospital. They lend a hand wherever help is needed, from staffing the Information Desk in the lobby to working in The Pink Bow Gift Shop. Volunteers are people who make a difference because of the role they play in lending support to our hospital community. Volunteers set an example for all of us, working for the satisfaction of helping others. As an NHB volunteer, you'll enjoy many rewards. You will feel a sense of accomplishment, learn new skills, meet new people, make new friends and make an invaluable contribution to your community. Volunteers have the opportunity to match their skills and interests with meaningful assignments. As part of the health care team, volunteers broaden and diversify staff efforts to meet the hospital's goal of providing comprehensive health care. There are many areas in which volunteer help is needed and scheduling is very flexible. For more information about being a volunteer at Navicent Health Baldwin, please read through the rest of this webpage. If you like what you've read then please complete an online volunteer application. You will then be contacted to schedule an interview for volunteering, based on availability. 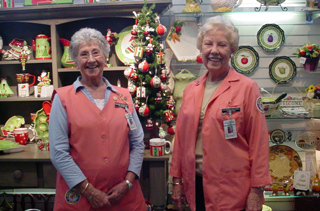 Gift Shop - Volunteers perform duties as sales clerks, help with inventory and merchandise displays. Volunteers with craft skills also create crafts and floral displays for gift shop. Auxillary volunteers also assist with Auxiliary fund raising projects. Information Desk - Volunteers who staff the information desk provide visitors with patient and hospital information, including giving directions to visitors in the hospital, delivering mail, newspapers and floral arrangements. Couriers - Volunteers who serve as couriers assist departments throughout the hospital by delivering necessary materials from one department to another. They also help with various projects within each department as needed. Activities include escorting patients and visitors, performing errands and assisting with various duties as needed. Department Volunteer - Volunteers can also be assigned to specific departments to help with day-to-day tasks or special projects. Youth Volunteer Program - Available to youth from 15 to 18 years of age, with volunteers performing various support services. This is an excellent program for young people who wish to provide valuable community service during their school breaks by helping others. The application process for this program is different, so please contact the Volunteer Services Office (478-453-3646) for more information. Harriet's Closet is a free resource center for all cancer patients who are presently undergoing or have undergone treatment at Navicent Health Baldwin. Harriet's Closet offers hats and shirts for men, women, and children, as well as wigs, jewelry, and cosmetics. Also available are walkers, toilet seat risers, and benches for bathroom use, as well as many other items. Individuals interesting in volunteering should first read the Volunteer Services Handbook and the Code of Conduct. Next, complete and submit an online volunteer application. You will find all of these materials at the links below. Once your application is received, it will be reviewed and you may be contacted to discuss your availability and areas of interest. Thank you for your interest in becoming a volunteer at Navicent Health Baldwin! In order to provide superior volunteer service to our hospital staff, we require each volunteer to work a minimum of 16 hours a month and give an 18 month commitment of their volunteer service. Which hours are you available for volunteer assignments? Are there certain days you prefer? Special skills or Qualifications. Please check which areas you have experience. What area(s) would you like to volunteer and why? By submitting this application, I affirm that the facts set forth in it are true and complete. I understand if I am accepted as a volunteer, any false statements, omissions, or other misrepresentations made by me on this application may result in my immediate dismissal. By entering my name below, I've confirmed that I read, understand and agree to the above statement. It is the policy of this organization to provide equal opportunities without regard to race, color, religion, national origin, gender, sexual prefernce, age, or disability. Thank you for completing this application form and for your interest in volunteering with Navicent Health Baldwin. We will review your application and based on placement availability and will contact your for an interview. Any questions, please contact Volunteer Services at 478-454-3709.